Today’s iOS devices include mono microphones that are good enough for general-purpose recording—making voice and video calls, capturing audio notes, and identifying tunes with Soundhound. But they’re not ideal for situations where you need higher-quality audio, such as when recording podcasts, lectures, or musical performances. 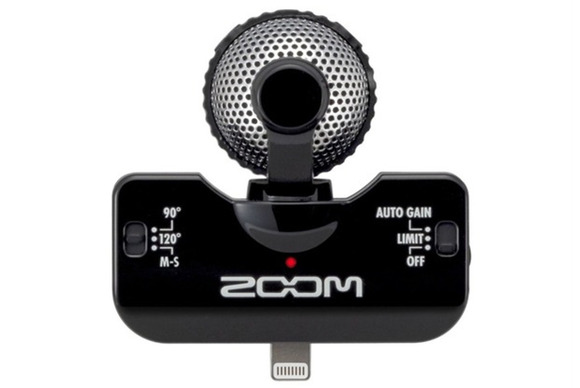 In such situations, an external microphone is the way to go, and Zoom's $125 iQ5 Professional Stereo Microphone captures good sounding stereo audio. The iQ5 is a Lightning-connector microphone, which means that it’s compatible with the iPhone 5 and later, the 5th-generation iPod touch, the 4th-generation and later iPad, and all iPad mini models. It comes from the same company that makes the well regarded H5 Four-Track Portable Recorder, and you can see the similarities in the design of the iQ5 as well as the free HandyRecorder app that works with it. However, unlike with the H5, which has two crossed microphones, the iQ5 bears a single perforated ball that contains the two microphone capsules. The ball sits atop the main unit, which hosts controls for adjusting mic gain and the width of the stereo field. You can also swivel the ball 90 degrees. You’d do this when recording a movie of a performance, so that the mic’s elements are pointing away from you while holding the iOS device in landscape orientation. The capability to swivel the microphone ball makes for a more-flexible recording companion. Beyond the ball, the iQ5 bears a number of other features. On the “back” are two switches. The one on the left controls the stereo width and offers three settings: 90 degrees, 120 degrees, and M-S. This M-S setting is a little confusing: It essentially disables the stereo-width setting when using the HandyRecorder app, letting you adjust the width in the app, instead; however, if you record from within with a different app, the stereo width is set at 120 degrees. The switch on the right is for controlling the microphone’s gain. The Auto Gain setting allows you to use one of the HandyRecorder app’s three auto-gain settings: Concert, Solo, and Meeting. The Concert setting is for loud sound sources, Solo is for quiet sources, and Meeting is for non-musical sources. Flick the switch to the Limit setting and you can adjust the mic’s gain with a Mic Gain wheel found on the side of the iQ5, if the audio coming into the mic is so high that distortion could result, the iQ5 attempts to limit the mic’s gain. You can disable this limiting, but still set the gain manually, by using the Off setting. On the left side of the iQ5 are Mini-USB and headphone ports. The USB port lets you charge (but not sync) your iOS device while the iQ5 is connected. The headphone port is for monitoring recording and playback; it’s a nice convenience, as the iQ5 blocks the headphone port on some iOS devices. If I have any complaints about the design of the iQ5 it’s that the Lightning-connector port isn’t the most robust anchor for accessories such as this. It’s a minor complaint because it’s the nature of the beast—Lighting connectors are small, and unless you want to junk up your accessory with clamps to more firmly keep it in place, you’re going to risk unseating it. Although you can record using the iQ5 with any iOS recording app, there are benefits to using Zoom’s own HandyRecorder. To begin with, if there’s new firmware available for the iQ5, HandyRecorder is the means for installing it. (The app automatically detects if the mic’s firmware is out of date and offers to install the latest firmware.) But it provides other advantages as well. If you've used one of Zoom's hardware recorders, the HandyRecorder app's interface should look familiar to you. HandyRecorder gives you the option to share your recordings via email or to SoundCloud. I’d welcome some additional options here—sharing via Messages and to the Music app, for example. You can also add EQ, reverb, and mastering effects to your files. Given that the iQ5 feels a little plasticky, I was honestly surprised by how good its recordings sound. The mic doesn’t offer the warmth or depth of a microphone with a much larger capsule, but for its size, the iQ5 does very well. I wouldn’t hesitate to use it as an interview microphone attached to my iPhone or even as a way to bootleg a concert (not that I would, of course). It can be a little sensitive to ambient noise—even when in the 90 degree position—but generally not to the point where you’ll be distracted by that noise when listening to the resulting recordings. As with any sensitive microphone with a somewhat large pattern, you’ll get best results when carefully considering your recording environment. But let your ears be the judge. Below are two recordings made at the same time. The first was recorded with my regular podcasting microphone—an ElectroVoice RE-20, somewhat off-axis—and the second was recorded with the iQ5 mounted on an iPhone 5s. Each is a 44.1kHZ .wav file. I suspect that after listening to those two files, you’ll come to same conclusion as I did: For a small and not-terribly-expensive mic, the iQ5 performs remarkably well. With the help of the HandyRecorder app, it’s also flexible. If you’re in need of an easy-to-use and good-sounding microphone for your iOS device, give this one a try. Zoom's Lightning-connector iQ5 Professional Stereo Microphone may look a little plasticky, but it delivers solid sound in a perfectly portable package.